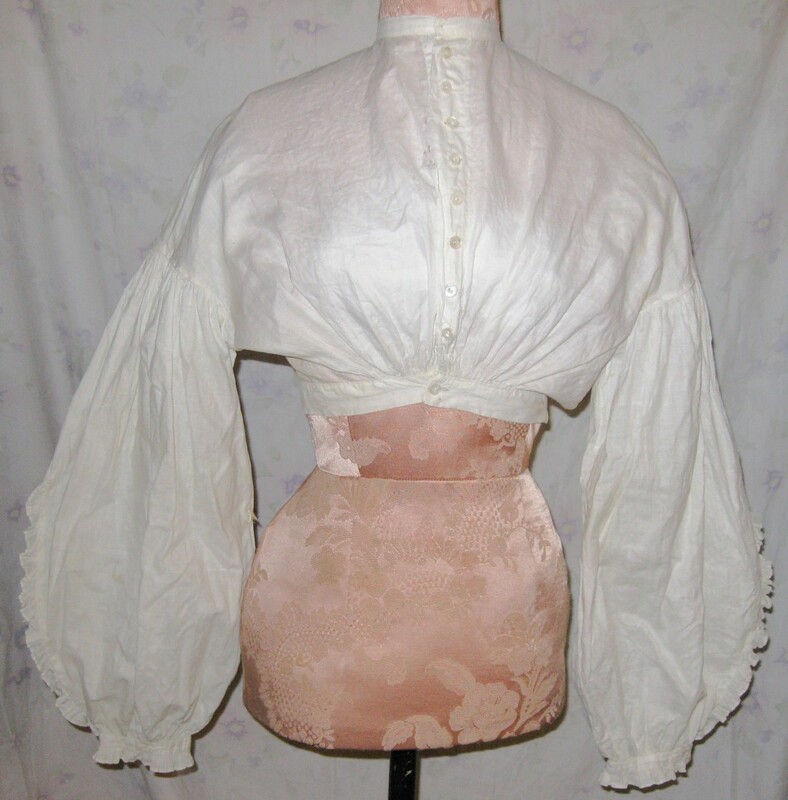 The ‘must have’ garments for trendy young ladies during the Civil War era would definitely include a white “waist” or blouse in modern terms. 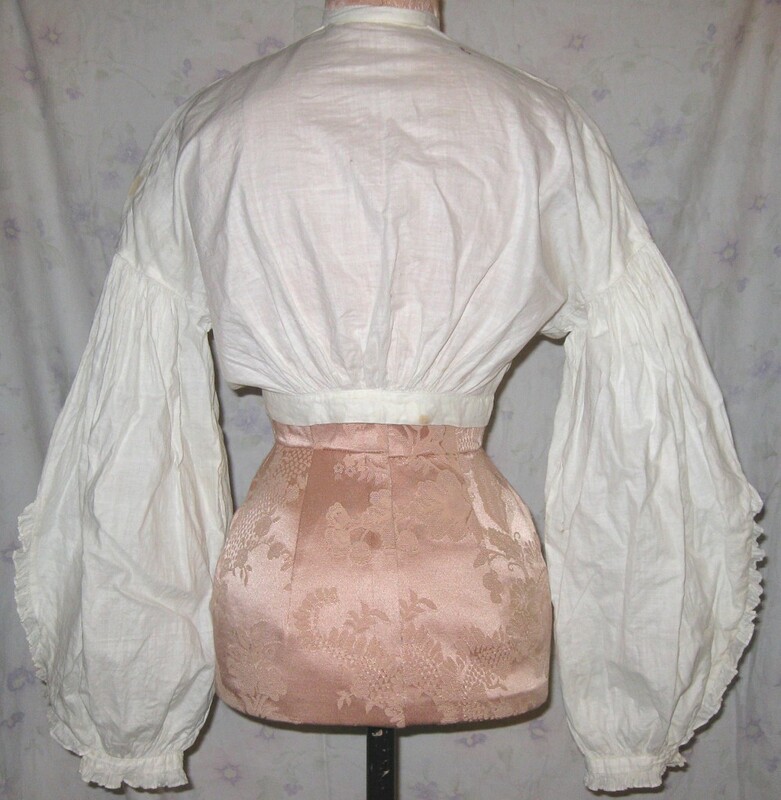 Unlike many similar blouses of the era, this one has beautifully hand gathered and hemmed ruffles around the wrists and inserted into a tuck made for the purpose along the lower portion of the very full bishop sleeves. 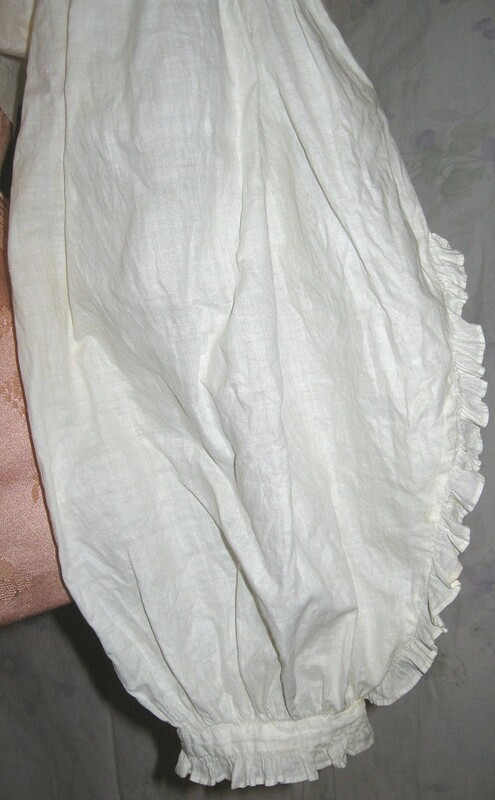 It is gathered at the center back and tightly gathered at the center front of the waist. It buttons up the front with small mother of pearl two-hole buttons. What adds even more to this garment is the handwritten signature laundry mark, C. A. Goslee. I searched Ancestry.com and only one person fits the name and likely age; Cynthia A. Goslee. She appears in the 1860 US Census as a 17 year old living in Jewett, Greene, New York with William Goslee age 65, a well off farmer ($2,000 in real estate and $1,100 in personal property) and Clarissa age 52, most likely her parents. In the 1870 census she was 25 year old and still living in Jewett. She was now living with Milton (Ret(ail) merchant & farmer) age 37, Esther L. (keeping house) age 33, Clara L. age 9, Freddie M. age 4, Clarissa (without occupation) age 62, Emma Johnson (domestic) age 21 and Frank Patterson (laborer) age 17. Cynthia herself was listed as employed as a “Clerk in Retail D.Y. Store” I assume Milton was her older brother and the others were his wife, children and their widowed mother. The last census reference to her was In 1910 where she is unmarried and living in the same town, but now with her nephew Fred M. Goslee. She went from a fashionable young lady in the 1860s & ‘70s to a ‘maiden aunt” living with her nephew in 1910. Condition: There are some scattered small holes, mainly near the center front, a small repair at the back of the neck and couple faint spots on the waistband. The sleeves! I love the ruffles on the sleeves.